A developer has put plans on hold to enforce £100 fines for residents parking on their own road in North Bersted after uproar from some residents who were not consulted. The petition of more than 200 signatures expressed frustration that not all residents had been part of a vote on the parking enforcement, which letters to residents explained were due to existing parking rules. Following a request for comment, a spokesman for Berkeley Homes said: “A consultation on parking arrangements was recently held at the request of many Bersted Park residents who had concerns over inconsiderate and inappropriate parking behaviour. “The consultation showed broad support for parking management to be introduced, but this has now been put on hold as some residents clearly feel their opinions have not yet been heard. Not all residents in Bersted Park are against the enforcement of parking rules in the area. 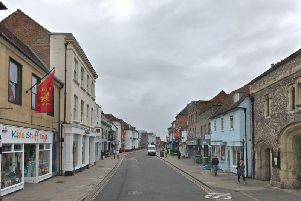 A number of residents contacted the Observer to say they thought the enforcement was needed for safety purposes as other measures had failed and there were covenants on the homes that included parking rules. Claire Barfoot said: “We struggle to get in and out of our drive regularly because of people parking opposite. “People park on drop down kerbs or up on the kerb, which can make getting around with a pram or pushchair difficult. Another resident, who did not want to be named, said she had paid substantially more for a home with two parking bays because she was aware of the parking covenants. But Lee Hill and other residents told the Observer that on buying a home with one parking bay they were assured they could park in the community centre, visitor spaces or along the road. Berkeley Homes has been approached for comment.